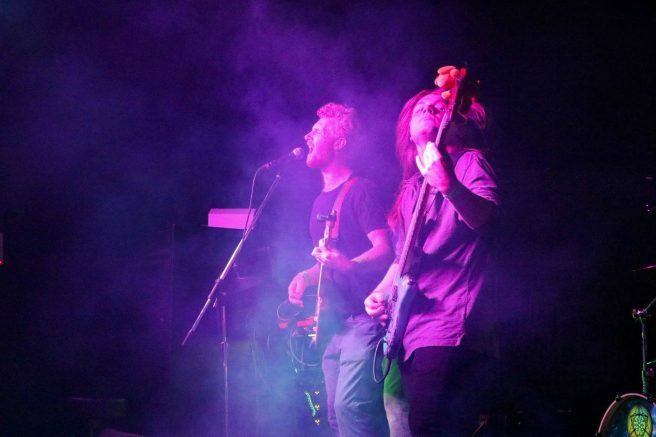 Technical difficulties, a year hiatus from playing live and preparing to send off their bassist are just a few of the difficulties local alternative band Lucid faced the day before their show at the Boardwalk in Orangevale on Friday. American River College students Matt Lomas and Tristan McNay have been friends since McNay joined the band in Dec. 2013. The band comprises of Lomas on drums,Tim Towne and Jordan Simpson on keyboard, Stu Sower as lead vocalist and guitarist and McNay, who performed for the last time as Lucid’s bassist. A few hours before they were to perform, band members Towne and Simpson stressed the importance of working together to problem solve. In this case their supportive nature and teamwork is what made it possible for them to have their equipment ready to go for the night. Fortunately, Towne possesses a lot of knowledge when it comes to programming, “If it wasn’t for Tim we’d be lost,” Simpson said. Beyond their technical problems and McNay’s last performance, the musicians discussed how they felt about playing. Lucid was fourth to play that night out of six bands. In order from first to last the list went as follows: Surviving the Era, Altessa, A Foreign Affair, Lucid, The -Body Rampant, and Demon in Me. The venue was relatively small but with more than enough room to move around and dance. “Boardwalk’s always been a good spot for getting good local bands,” Towne said. Minutes before Lucid was to play, fans and first time listeners gathered at the railing in front of the stage. Danny Hopkins and John Valencia, friends and fans of Lucid, were among the crowd of people gathered and waiting in front of the stage. Hopkins wasn’t the only one who noticed and liked the change in their music. Not only was their support from their friends but also family. Gina Holmes, McNay’s mom, was front and center. Each band played for roughly twenty to twenty-five minutes. Lucid ended up playing five songs in total, three of them being off of their EP, “Now I can see again”, “All for you” and “Starlight”. The other songs were not off the EP but were new and they were, “Is this real” and “Do you know”. The aftermath can best be explained by the band members themselves and the fans who came out to support. As for the final hurdle, playing one last time with McNay, there were only good things to be said. Lucid is “the perfect blend of literally everything,” Hopkins said. Be the first to comment on "Lucid makes dreams come true"